ShadeTree specializes in all things outdoors. They carry a range of products that are customizable to various dimensions, including residential and commercial canopy systems, retractable fabric awnings, patio furniture, interior window treatments, bungalows, Trex pergolas, all-weather canopies, and backyard blinds. Awnings have been a staple for outdoor living for decades, and not a lot has changed about many of the available products’ designs. ShadeTree is different in that sense. Their products have more of a modern feel than many of the traditional styles found throughout the nation. They carry three models of deck and patio awnings. All three are customizable to various extents. Frames can be made in white, tan or mocha. ShadeTree uses Sunbrella fabrics, and they have over 40 colors to choose from. Buyers can also choose how they want their awning to function, whether it is manual or motorized. The ShadeTree Classic comes in a white frame. Buyers can choose a width from 8’ to 28’, and can project from 8’ to 10’. This model comes with a five-year warranty. The ShadeTree Prestige comes in widths from 7’ to 40’, and protrudes from 5’ to 11’6”. Buyers can choose from any color frame. It comes with an eight-year warranty. The top-of-the-line ShadeTree Optimum comes in widths from 9’ to 40’, and projections from 6’8” to 13’3”. It can be made with any of the frame colors, and comes with a limited lifetime warranty. ShadeTree Retractable Canopy Systems are another way homeowners and businesses can stay in the shade. The structures utilize pergolas and strips of Sunbrella fabric to protect people and property from the elements with a different look than traditional awnings. The systems use rollers that enable consumers to easily change their outdoor setting. There are five models to choose from, each for different situations. For example, The Forester model must be attached to a wooden structure, while the Vinyl Pergola model can be freestanding. The models also differ in materials used, some are made of wood, while others are made of aluminum or vinyl. ShadeTree also carries three types of all-weather canopies. The Sky Cover is a retractable motorized canopy made of waterproof canvas. The Metropolitan is a structure made of aluminum with a retractable cover, a gutter system, and available drop-down panels. This model boasts being able to resist wind up to 75mph. The Pinehurst is similar to the Metropolitan, but it is made of wood. Drop down panels can be added to most canopy systems for extra protection. ShadeTree works with some well-known names in the home industry. They work with Hunter Douglas to provide high quality, energy efficient window treatments. They get all their fabrics from Sunbrella. Their systems are procured from various vendors that specialize in what they do. 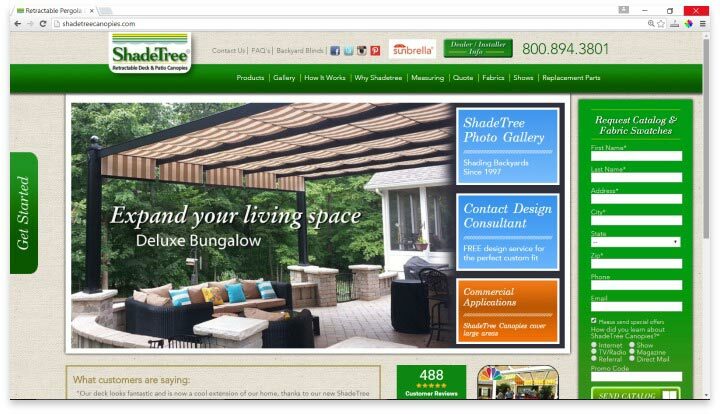 The ShadeTree company receives rave reviews from past customers. They talk about the company’s proficient customer service, quality of their purchase, and some reviewers posted years after purchase, and are still enjoying their awning or canopy system. One thing to note, is that reviewers did state the systems are not completely water proof, and water does leak a little bit through the fabric. Another reviewer stated that, while it was easy to get someone to initially install the system, they had trouble getting someone to come fix it when maintenance was required. ShadeTree offers a range of options to choose from, including both traditional and modern styles made in a variety of materials for residential and commercial canopy systems, retractable fabric awnings and canopies. ShadeTree offers a range of options to choose from, including both traditional and modern styles made in a variety of materials. However, systems can get pricey due to the quality of the product. This could potentially save the consumer money in the long run, especially considering the warranties that come with some models. However, budget constraints could make some consumers cross ShadeTree off their list. Have you had an experience with this company? Please share your ShadeTree reviews below.